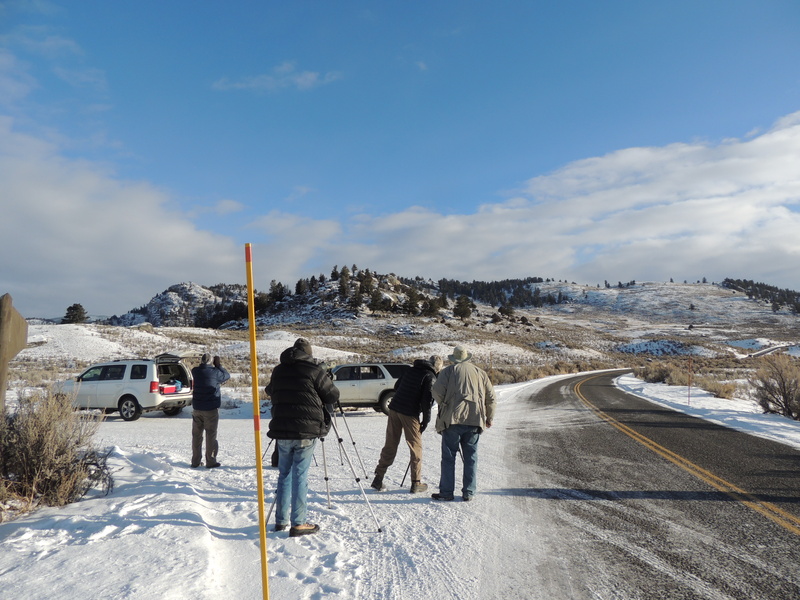 I’m standing on a hilltop in Yellowstone on a cold and bright December morning. The snow beneath me is covered with hundreds of wolf tracks. They must have been through here early this morning – the tracks are clearly fresh, and there are no other people tracks around. I look over my shoulder. It’s eerie. Where are they now? 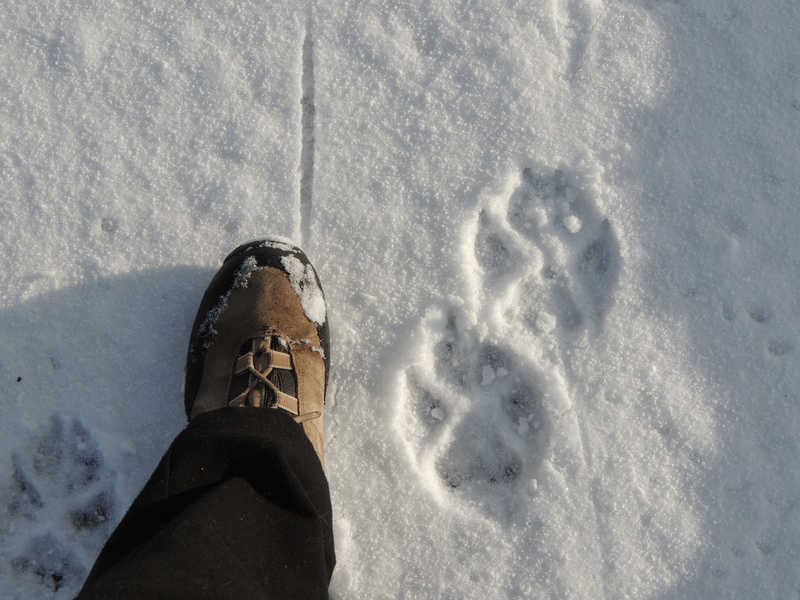 I’m not generally afraid of wolves, but when you see how big their tracks are…well, it’s eye-opening. I notice a line of little coyote tracks in the midst of all of these giants. How brave of him to be anywhere near this place! The silence is broken by howling to the east of me, with answering howls from the hills across the river. Not far! I head back to the trailhead where Bill is waiting. The Wolf Project team has arrived. It’s the Prospect Peak Pack, but they’re not sure about all the members, and they’re not sure why they’re this far east. 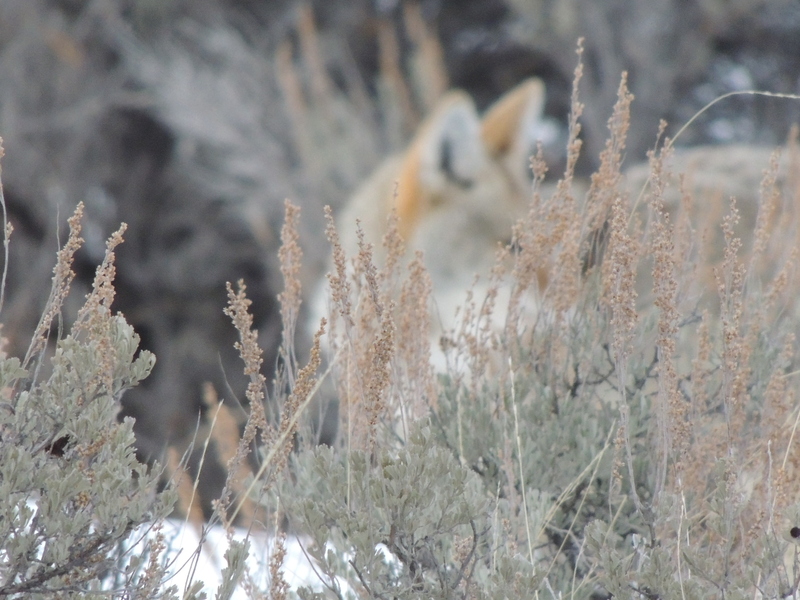 The wolves are not too close, but we can see them clearly with our binoculars, and get beautiful views of them through the great scopes that the wolf folks have. I can even get some photos with my little camera. We stayed until all was quiet and then went to explore elsewhere. We returned late in the afternoon and once again followed the tracks to the hillside. 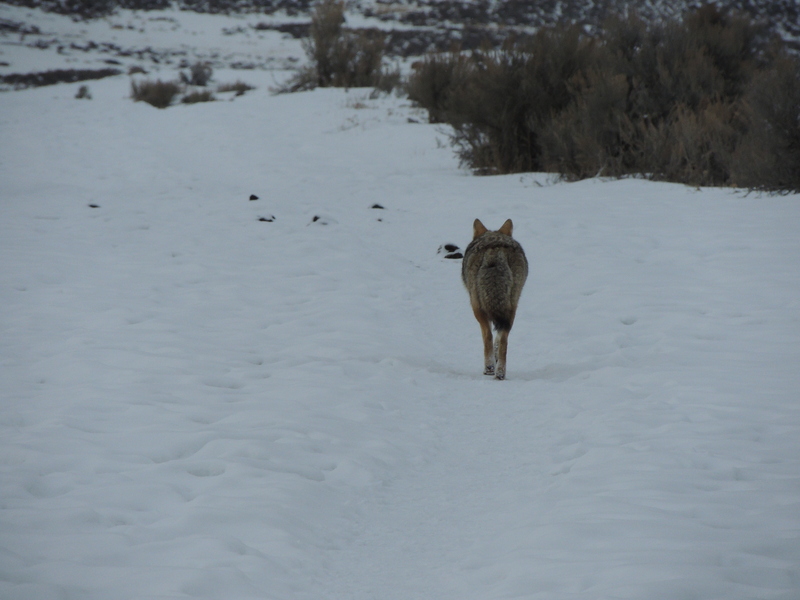 As we walked a lone coyote came out of the sagebrush just ten feet from us and walked down the trail ahead of us. Was he the brave little guy whose tracks I’d seen that morning? He sure wasn’t worried about us. 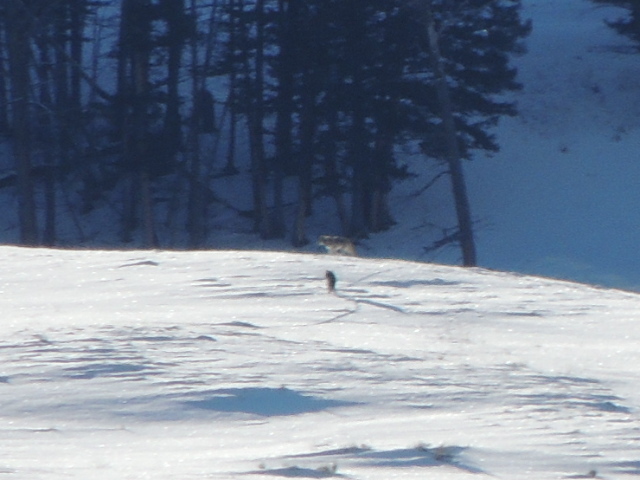 The coyote turned off the trail, and we thought he’d headed off, but as we got closer we saw that he was urgently digging in the snow. There was something there for him to eat, and was not going to be distracted by a couple of weak looking humans. He found it. The wolves started howling as we watched. 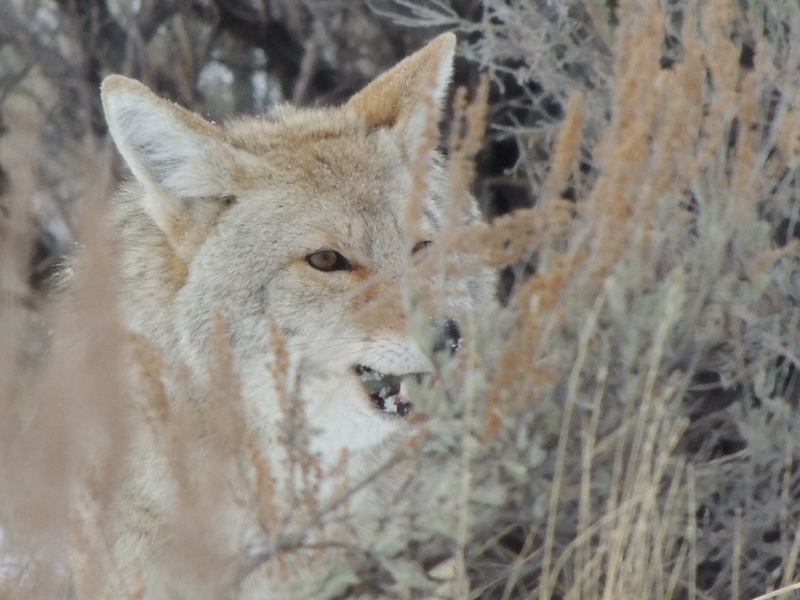 I thought the coyote would finally give up, but no. He paused, and looked our way, but he wasn’t giving up a dinner this good. And the wolves? They stayed hidden. But hearing their howls at the end of the day was a perfect solstice gift. 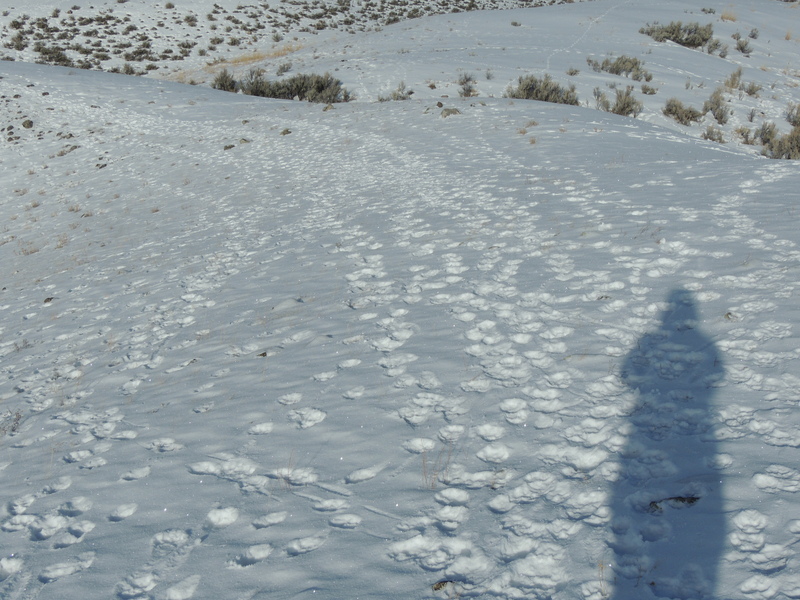 This entry was posted in Adventure, Montana, Nature, Outdoors, Wildlife, Yellowstone and tagged Prospect Peak Pack, wolf tracks, Yellowstone wolves. Bookmark the permalink. I only saw one wolf while I was working in Yellowstone, but that picture of your foot next to the wolf-prints blows me away! And I don’t have little feet, either! I’ve seen tracks before, but these were incredible. Awesome! 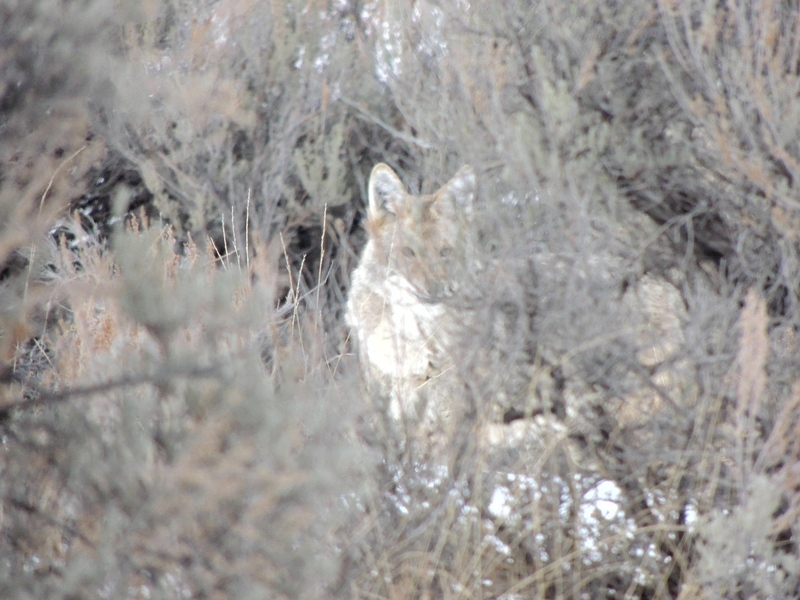 I’ve never seen a wolf, but I’ve heard a pack of them howling at nite in central Idaho. very cool! I think hearing the howling is as cool as seeing them. Thanks. I loved reading this. 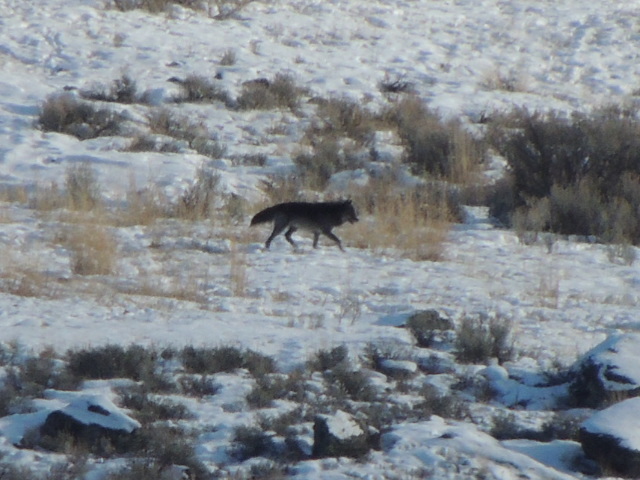 I’d so wanted to see the wolves when we were in Yellowstone a couple years ago and we didn’t get a chance to see them. Great photos, great story. Maybe next time you’ll get to see them – or at least hear them. Thanks so much for the nice words. What a beautiful Solstice Gift, thank you! My friends were in Yellowstone and came home talking about the wolves. I posted this on Facebook for everyone to see. I’m so pleased! Thanks very much. A Beatuiful way to welcome back the sun! 🙂 No, that’s definitely my not-particularly-petite shoe! I’ve seen other tracks, but they never shocked me the way these did. Maybe the Prospect Peak Pack has oddly large feet. Beautiful job. 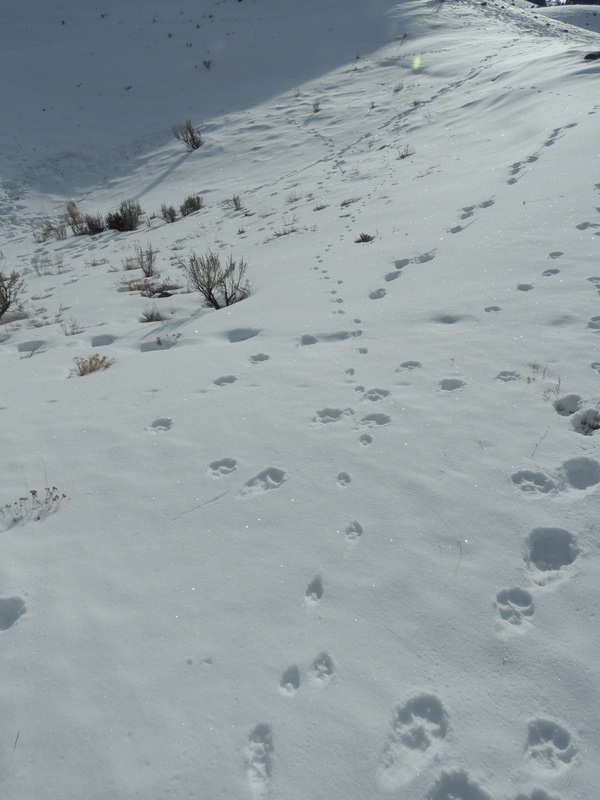 I really enjoyed the contrast between the wolf tracks and the coyote’s delicate little prints. Thanks, I thought that was pretty neat too. Now I’d say you had a howling good solstice! Wonderful! Merry Christmas to you too, and thanks for the nice comment! Wow! The wolf paw prints were almost as big as your foot. Even if I never actually saw any wolves, I would be quite intimidated by the paw size alone. They are intimidating, aren’t they? The wolves themselves actually look less scary. Thanks for the visit. What a beautiful place to spend the solstice, surrounded by raw nature….wolves and all. I had no idea their paws were so large! It is a beautiful place, and the wolves just add to that beauty, don’t they? Wow, so many wolves! I have never seen a wolf – I guess it would be interesting to see one. They are interesting creatures. Looking forward to reading more of your blog. 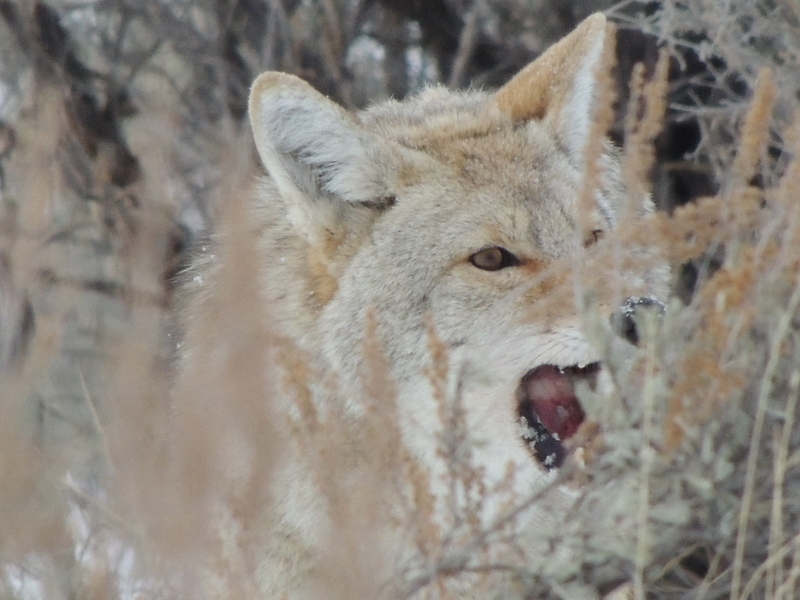 I hung out a few hours with some of Yellowstone’s wolf people, and they’re a hearty bunch. Never saw a wolf, or tracks. Excitement was palpable when they found a bison carcass, but still no wolves. I really enjoyed your post and incredible photos. Amazed at the size of the paw prints. 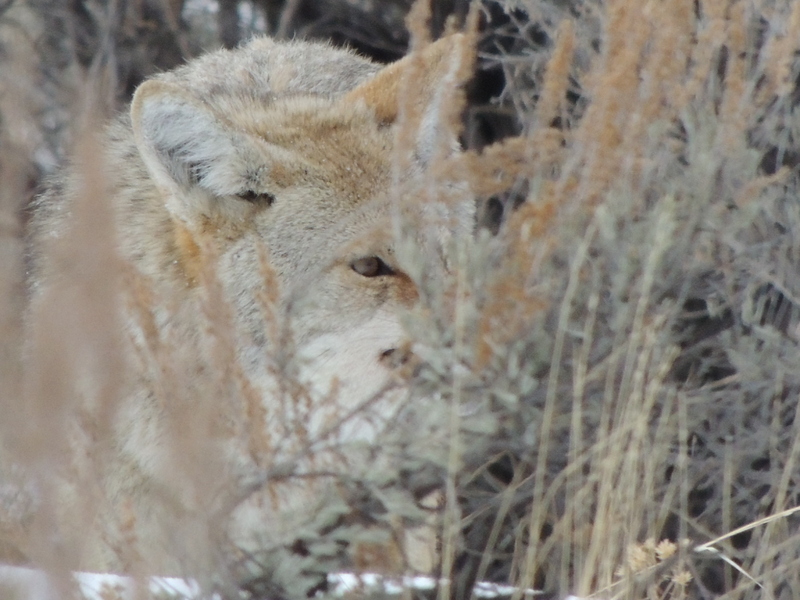 Last spring we were in a similar situation – watching three bison carcasses, with wolves nowhere in sight. No bears either. Guess they had better pickings elsewhere! Thanks for the visit. Feeds both sides of the brain ❤ Lovely! Thank you for this wonderful post~ it does indeed feed both sides of the brain!